Sea stories, scuttlebutt and fantastic photos covering America\’s official Tall Ships® Races! Join the Race Team this summer! Sail onboard the USCG Eagle! 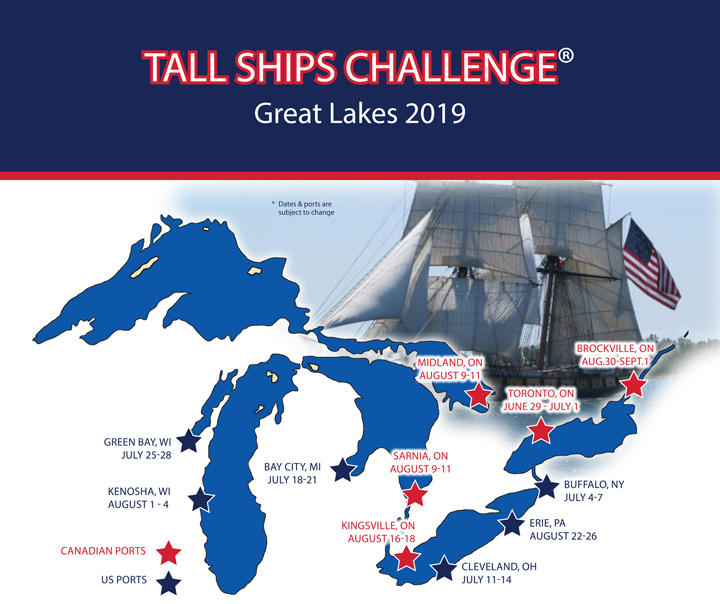 We could not be more excited to announce our TALL SHIPS CHALLENGE®2019 Race Series in the Great Lakes. Eleven ports will host a fleet of tall ships throughout June, July and August. But wait, Sarnia and Midland are on the same dates!? How observant of you. While some ships will be in Sarnia and the Detroit River, the rest will head up to beautiful Georgian Bay and Midland for the weekend. We have an amazing line up of returning ports – Brockville, Toronto, Erie, Cleveland, Green Bay and four time Port of the Year winner, Bay City. We also have some fresh faces in the mix this year – Buffalo, Kingsville, Sarnia, Midland, and Kenosha. We’ll also have your favorite Great Lakes (and beyond!) tall ships as part of the fleet and we are sprinkling in some new ships for your viewing pleasure. It’s going to be a busy summer and I can’t wait to get started. Stay tuned for more updates, including websites as they go live and participating ships. Mark your calendars for the summer of 2019! Tall Ships America Executive Director search is underway! The search for Tall Ships America’s next Executive is officially open, and the job description and details can be found here: Tall Ships America Executive Director. We are poised to make great strides forward and looking for an experienced leader with clear vision, knowledge of the field, and deep dedication to our mission to help us chart the course ahead.